Dear blog reader, sorry I've been out of touch. 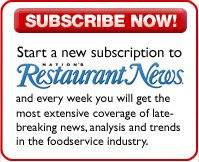 I've been doing a lot of reporting on Nation's Restaurant News' web site, which is my main job. In fact, this blog is hosted there, too, as part of our Food & Beverage page. Check it out there, or here; whichever you prefer. When it comes to eating, it’s a well-established rule that good taste trumps good nutrition, almost all the time. It’s true that a growing number of Americans will lean toward eating something that seems to be better for them as long as it’s delicious, but it has to be delicious first. That’s not necessarily true with drinks. We Americans might be loath to eat our medicine, but we seem O.K. about drinking it, whether it’s vaguely life-sustaining antioxidants, restorative electrolytes, oddly named probiotics, or fast-acting energy boosters. I think that’s why salty, weird-tasting sports drinks remain popular even as carbonated beverage sales continue to decline, and why sales of energy drinks are booming despite the fact that many of them taste like sweetened battery acid. The last time I checked statistics for sales of ready-to-drink tea in the United States, 40 percent of it was green tea. You can’t tell me that most Americans actually like the subtly bitter, grassy taste of green tea. Besides, most bottled green tea is sweetened (these days often with cane sugar or agave nectar) and mixed with enough fruit flavoring that you’d have no way of knowing there might also be some tea in there somewhere. But if we don’t necessarily embrace the flavor of green tea, we certainly seem to like the idea of it and all its antioxidants — and, I suspect, the fact that it comes from the exotic Far East, where, for some reason, we think everything they eat is good for you. With the exception of the explosion of smoothies everywhere, from hotel brunch menus to McDonald’s, restaurants are really just in the early stages of capitalizing on the drink-as-health-tonic trend. Some furtive experiments have been made to sell branded energy drinks, but from what I’ve heard they’ve generally been drunk more by staff than customers. Starbucks has finally introduced its own line of energy drinks called Refreshers. They’re sparkling beverages boosted with caffeine-charged green coffee extract that the chain’s web site promises “looks and tastes nothing like coffee,” as well as ginseng and B and C vitamins. Aaron Jourden, an editor with foodservice research firm Technomic’s information services, whom I interviewed for a story I wrote earlier this month on cold drinks, pointed out that both Honey Dew Donuts and Sheetz were spiking some of their beverages with branded energy drinks, and that 7-Eleven now has Big Energy Coffee, which has no sugar, but does have ginseng, gingko and vitamins. I also interviewed Regan Jasper, the director of hospitality and beverage for Fox Restaurant Group in Scottsdale, Ariz. For Fox’s True Food Kitchen, a four-unit concept with food based on the anti-inflammatory diet of Andrew Weil, he developed an energy drink called the Medicine Man. To make the drink he steeps 10 black teabags in a teapot for about an hour to make a dark, bitter caffeine extract. He mixes two ounces of that with pomegranate juice and cranberry juice, both of which are supposed to be anti-inflammatory; muddled blueberries that are reported to have anti-aging qualities as well as being awesome for your prostate; and extract of sea buckthorn, a favorite ingredient of Dr. Weill’s despite its medicinal taste and extreme sourness. Jasper tells me that if you sweeten sea buckthorn extract with agave nectar, it takes on a flavor reminiscent of peach or apricot. That concoction is topped with soda water and sold for $6 for a 16-ounce glass. It’s the restaurant’s most popular beverage, a clear indication that drinks-as-medicine is a trend with legs. Well, I did slightly better in predicting the winners of the Beard Awards this year than last year. I got five out of 20 right instead of four out of 19, which is still terrible. I correctly guessed that Next would win for best new restaurant, PDT for outstanding bar program, Boulevard for outstanding restaurant, Michael Anthony for best chef in New York City and Chris Hastings for best chef in the South. But no matter. It’s not whether you win or lose a Beard Award, it’s how you work it. Getting nominated year after year means you get free press year after year. Once you win, you get a medal and a burst of free press, but then you have to find new ways to draw attention to yourself. I chose a different strategy in covering the awards this year. Rather than spend the night in the press room, which is always a fun party, but completely unrelated to the actual awards, I decided to go ahead and sit in Avery Fisher Hall and take notes. I was worried that I’d fall asleep. I'd awakened in Chicago at 6 a.m. to write this trend piece on what was on display at the National Restaurant Association show in Chicago, then I took a 15-minute nap, packed, headed to the airport, landed in New York, took a taxi to NRN's office, changed into my tuxedo and took the 1 train to Avery Fisher Hall for the Beard Awards. But I guess the double-espresso I had before the awards started did the trick, and I sat through the three-and-a-half-hour ceremony wide awake, only getting antsy after two hours because I'd been sitting for two hours. It had been years since I'd sat in that hall, and I realized that the best part of the awards was missed in the press room. It was the stuff that seemed like filler — the America's Classics awards given to old-time diners and similar places, the humanitarian and lifetime achievement awards, given to Charlie Trotter and Wolfgang Puck, respectively, this year — that was really entertaining. Even the odd and maybe kind of out-of-place 20-minute performance by actor Robert Neal of part of the play “I Love to Eat,” was entertaining. The play by James Still is being performed in Indianapolis and seemed to be added to the beginning of the award ceremonies expressly to make people sit longer. It was as if the James Beard Foundation had rented out Avery Fisher Hall and was determined to get its money’s worth. The awards themselves, well, the winners' names are read, they come on stage, thank their spouses, staff and business partners, occasionally make an amusing quip — Tory Miller, chef of l'Etoile in Madison, Wis., and winner of the award for best chef in the Midwest, thanked James Beard for being “such a crazy old weird dude” — and sit down. There are 22 of them, including the graphics and design awards, so it takes awhile, but the Beard Foundation seems to be working on streamlining them even further. They don't let the announcers — usually past winners and a representative from that particular award's sponsor — read the nominees' names anymore (except, for some reason, B. Smith, who gave out the graphics and design awards). Instead, a recorded voice reads them, keeping the presenters from butchering the names, which had been a constant problem in past years. And master of ceremonies Alton Brown seemed intent on moving things along. The awards are followed by a reception that seems to become more of a zoo each year as throngs of foodies in formalwear crowd each other out to try to get something to eat. I'd had a big lunch — a torta from the Frontera Grill at O'Hare — because I don't like to stand in line for food, so I mostly sipped wine and chatted with people. I caught up with inimitable chef-restaurateur Michael McCarty, who was visiting with Ruth Reichl, and with Nic Jammet, partner in the SweetGreen fast-casual salad and frozen yogurt chain based in DC. Food writer and drink maven Francine Cohen chastised me for not being in the press room but was good enough to bring me a delicious little white wine, made mostly of Colombard, of all grapes, from Southwestern France. After snacking on Paul Kahan’s blood sausage, I realized the party was over for me and headed for the logical first after-party, at Boulud-Sud, across the street from Lincoln Center. But before I went in I ran into Chris Cosentino, of Incanto in San Francisco, and Ken Oringer, of many cool places in Boston, who were intent on going to Otto. You see Matt Molina, the chef of Mozza in Los Angeles, had been named best chef in the Pacific, so Mario Batali, one of Mozza’s co-owners, was fêting him downtown, as is the custom when you win a Beard Award. My philosophy when it comes to after-parties is not to go where everyone’s going, but where the people I like are going. So to Otto we went, where I commiserated with Chris Cosentino about the coming end to foie gras in California. It becomes illegal in that state as of July 1, a fact many people at the awards were protesting against by wearing "Save the Foie” pins — too little, too late, I'm afraid. The law was passed in 2004, after all, to give foie gras producers time to find a way to make the fattened duck liver in a way animal welfare activists deemed acceptable. The pro-foie crowd might have considered organizing back then. I also met Mario Batali, perhaps for the first time, I'm not sure. I talked to him about figuring out how to report on the Beard Awards. Reporting on who won is silly, since the Beard Foundation live-tweets the event and a list of the winners is readily available online. He agreed that the rapportage of the awards was meaningless, but that there were plenty of interesting back stories, such as Michael Anthony’s recovery from heart surgery this year — something Anthony mentioned when accepting the award for best chef in New York City. Seattle-based chef and restaurateur Tom Douglas was there, too. I thought he was out of town, because his business partner, Eric Tanaka, accepted the award for outstanding restaurateur on his behalf. But Tom said he just didn’t like public speaking, and that Eric was a genius and should have been the one to accept the award anyway. I got kind of philosophical with Daniel Holzman of The Meatball Shop, and learned something of the life story of his business partner Michael Chernow. Chernow told me he had a bit of an acting and modeling career, which was how he ended up modeling for a recent J. Crew catalog. The fact that J. Crew also mentioned that he owned The Meatball Shop was a nice added piece of free press. The party started winding down around 2 a.m., and I quickly swung up to the annual keg party at Eleven Madison Park to congratulate my friend Will Guidara, the place’s co-owner, for Daniel Humm’s victory as the country’s Outstanding Chef. I stepped over the broken beer bottles, gave him a hug and called it a night. Once again a coterie of food writers, chefs and restaurateurs have nominated a talented array of professionals to win the James Beard Foundation Chef and Restaurant Awards, and once again I shall endeavor to guess who they will ultimately pick as the winners. These predictions are based, as they are every year, on the notion that the best nominees are not necessarily selected; the most popular ones are. Of course, all the nominees are deserving and I hope they all leverage their nominations to promote their services and improve their business. But the winners will be the ones about whom there is the most buzz, about whom the media, nationally and, more importantly, in their own regions, feel good about. I think local and regional media are most important because judges are instructed to vote only in categories in which they feel qualified to vote, and to promise not to vote for restaurants where they haven’t eaten. So although I cover the whole country, being based in New York I would not vote for best chef in the Southwest. So that’s how the voting works, and below are my predictions of who I think will win in categories that I care about. These predictions should in no way be seen as my votes for the awards. They are who I think will win, not necessarily who I’d like to win. Thomas McNaughton, Christina Tosi and Sue Zemanick all were nominated last year, but I think they’re going to be disappointed by the power that is Grant Achatz and his restaurant Next. I think Dave Beran will win. This is tricky. Not only is it a brand new category, meaning I don’t know how people traditionally vote, but also because, although people do go goo-goo ga-ga over Grant Achatz and will feel compelled to vote for his Aviary, I’ve never met anyone whose eyes don’t moisten a little bit in admiration of James Meehan, the owner of PDT. I’m going to guess PDT. Chefs love the Blue Ribbon restaurants. They love them! But they also admire Jean-Georges Vongerichten’s restaurants, whose financier is Phil Suarez. And so do food writers. Both of those restaurateurs, and Tom Douglas, were nominated last year. This year I think Phil Suarez is going to get it. This is sort of a lifetime achievement award and goes to a restaurant that has paid its dues. All of these restaurants except Balthazar also were nominated this year. The award could easily go to Blue Hill, whose executive chef Dan Barber is a media darling, but there’s something about the gravitas of Boulevard that I think will result in it getting the medallion. Highlands Bar and Grill in Birmingham, Ala. This is also a sort of lifetime achievement award (José Andrés got it last year). As such, it’s kind of surprising that only Paul Kahan and Gary Danko were nominated last year. I think it will go to one of them, and I think there has been more buzz lately about Paul Kahan. So I think it will go to him. Nancy Silverton of Pizzeria Mozza in Los Angeles. Joanna Chang, Dahlia Narvaez and Mindy Segal all were nominated last year, which improves their chances, but I think Daniel Boulud’s star power will shine through and Ghaya Oliveira will win. Joanna Chang of Flour Bakery + Café in Cambridge, Mass. Mindy Segal of Mindy’s Hot Chocolate in Chicago. La Grenouille and Topolobampo are back from last year. The judges like giving awards to both Tony Mantuano of Spiaggia and Rick Bayless of Topolobampo, but I’ve been hearing Michael Mina’s name in the ether a lot lately. I think his restaurant will get it. La Grenouille in New York City. A16, Blackberry Farm and Frasca were nominated last year. Blackberry Farm always gets nominated for something, and they don’t win much. But their PR team has been promoting them pretty well of late, and I think it will be enough to push them over the top. The Barn at Blackberry Farm in Walland, Tenn.
Frasca Food & Wine in Boulder, Colo.
Sam Calagione, Merry Edwards and Paul Grieco are all back for another year. I predicted that Grieco would win last year and I totally blew that one. Although New Yorkers tend to have an advantage in the James Beard Awards, I’m still betting that Sam Calagione’s going to win this year. Neal Rosenthal of Mad Rose Group in Pine Plains, N.Y.
Last year, on a roster as dominated by Chicago as this one is, Alex Young of Zingerman’s in Ann Arbor, Mich., walked away with a win. Could Anne Kearney do the same? Yes she could. But maybe Stephanie Izard’s star power as a former Top Chef contestant could giver her the edge. Then Again, Sepia was in a Hollywood film, The Dilemma. I’m betting on the TV chef. Only Vikram Sunderam is new to this list, so it could go any way. But I’ve heard Cathal Armstrong’s name on a number of occasions recently. There’s buzz about him, so he’ll probably win. Cathal Armstrong of Restaurant Eve in Alexandria, Va.
Johnny Monis of Komi in Washington, D.C.
Peter Pastan of Obelisk in Washington, D.C.
Maricel Presilla of Cucharamama in Hoboken, N.J.
Vikram Sunderam of Rasika in Washington, D.C. Here, too, there’s only one newcomer, Gerard Craft. I’m kind of at a loss for this one, but the name Colby Garrelts is jumping out at me. If it jumps out at me, it could well jump out at a Midwestern judge. Colby Garrelts of Bluestem in Kansas City, Mo. Lenny Russo of Heartland Restaurant & Farm Direct Market in St. Paul, Minn.
Congratulations to Mark Ladner, who joins four nominees from last year. Ladner is the chef of Mario Batali’s only four-star restaurant, which is a big deal. On the other hand, everybody loves Danny Meyer and his restaurants, giving Michael Anthony a good shot. But they admire Michael White. Does admiration trump love? No, it does not. They’ll vote for Michael Anthony. Jamie Bissonnette’s the only newcomer to this list. He was named the People’s Best New Chef by Food & Wine magazine’s readers last year. It’s possible that the Beard Foundation voters will instead vote for Gerry Hayden, showing their erudition by selecting the former chef of Aureole. But often when a chef wins one award he or she wins many of them. I think Jamie Bissonnette will take this one, too. Gerry Hayden of The North Fork Table & Inn in Southold, N.Y.
Matt and Kate Jennings of La Laiterie in Providence, R.I.
Eric Warnstedt of Hen of the Wood in Waterbury, Conn.
Is it possible that Food & Wine Best New Chefs is becoming the Golden Globes to the Beard Awards, which are often called the Oscars of the fine dining world? Izard was a Best New Chef last year, and so was Jason Franey. Canlis is a very old and very much respected restaurant that has been given a facelift by brothers Mark and Brian Canlis — the third generation in the family to run the place. It’s a sentimental favorite, and we love sentiment. Congratulations in advance to Jason Franey. I wish I knew how old the average California judge was. Those who remember Michael Chiarello from his Tra Vigne days will feel inclined to vote for him again. Then again, this is California, where young, hip and cool people like Chris Cosentino are admired. But I think Daniel Patterson is emitting an aura of gravitas that I’m not getting from the other chefs. Will gravitas translate into votes? Maybe not, but I’m betting that it will. Michael Chiarello of Bottega in Yountville, Calif.
Christopher Kostow of The Restaurant at Meadowlands in St. Helena, Calif.
John Harris, Chris Hastings and Tory McPhail are all back from last year. Based on nothing but my gut, I think Chris Hastings is going to win this year. Chris Hastings of Hot and Hot Fish Club in Birmingham, Ala. Huge Acheson of Five and Ten in Athens, Ga.
Craig Deihl of Cypress in Charleston, S.C.
Edward Lee of 610 Magnolia in Louisville, Ky.
Joseph Lenn of The Barn at Blackberry Farm in Walland, Tenn.
There’s been a huge turnover of nominees in the Southwest. Bruce Auden is the only returning nominee. What does that mean? It could mean anything, but in my experience bigger cities have more judges, and Houston is now the third biggest city in the country. That gives a Hugo Ortega an advantage that I think will result in his victory. Kevin Binkley of Binkley’s Restaurant in Cave Creek, Ariz.
Paul Qui of Uchiko in Austin, Texas. And those are my predictions. If you have some of your own, why, go ahead and share them in the comments section. I had a fun lunch today at the David Bouley Test Kitchen, which is a place that Bouley set up in Tribeca as a sort of food lab for visiting chefs to play in, but it also has become an event space. The lunch was thrown by Legends From Europe, a three-year marketing campaign by the Italian consortia representing three Italian cheeses — Parmigiano Reggiano, Grana Padano, and Montasio — and Prosciutto di Parma and Prosciutto di San Daniele. Since those consorzi are traditionally enemies, it’s something of a political breakthrough that they’re all working together. The Parmigiano Reggiano and Grana Padano people announced their partnership a couple of years ago with press conferences and a big party at Madison Square Garden (Magic Johnson inexplicably walked through the party, causing macho Italian-American men to become giddy) followed by a VIP viewing of a basketball game in the fancy boxes at the top of the Garden (Knicks vs. Nuggets, which the Knicks inexplicably won). Here’s what nobody ever says about those two cheeses, which come from similar parts of Italy and are part of the same family of cheeses known as grana (hard, aged cheeses that cleave in a particular way): Parmigiano Reggiano is more expensive than Grana Padano, it’s generally aged longer and is widely regarded as being more complex in flavor and, well, better. That’s not bad for Grana Padano, which is suitable for cooking or grating and serving over pasta. Parmigiano-Reggiano would be wasted if used in that way, and it’s too expensive for non-rich people to use as anything other than a special-occasion cheese. I understand why saying that is politically sensitive, but they really need to get over that. Parmigiano Reggiano and Grana Padano are not natural competitors. They are different products at different price points to be used differently and eaten on different occasions. I think they’ve decided to work together to stress that they are different from generic Parmesan cheese, and consumers should know the difference. Bringing two kinds of prosciutto into the mix just makes it better all around. And Montasio, well, why not? It's delicious and melts good. So, we had five food products, all from Northeastern Italy. So what wines did they serve during the pre-lunch reception? Two sparkling German wines. At lunch, the wine was French — a white Bordeaux and a red Burgundy. We asked the Test Kitchen's manager why he did that, and he said he was instructed that he should by no means use any Italian wine, because members of the different consorzi would never agree on which wines were suitable to be drunk with all of their products. The Montasio and Prosciutto di San Daniele people would likely have been happy with a Tokai Friuliano, but the other three groups might have been irked by such a choice. And I can't imagine the Friulians doing anything but smirk if they were served a Lambrusco from Emilia Romagna. Hot caramelized Anjou pear with chocolate, biscuit Breton, hot truffle sauce, lemon verbena and Tahitian vanilla bean ice cream.